Here is a news report on the Civil Human Rights Front-organized march on behalf of universal suffrage in Hong Kong. (Ming Pao via Yahoo! News) Civil Human Rights Front Claimed 5,000 People Participated In March. March 18, 2007. When the marchers reached Government Headquarters at 5pm, they held an assembly at the scene and then they dispersed. 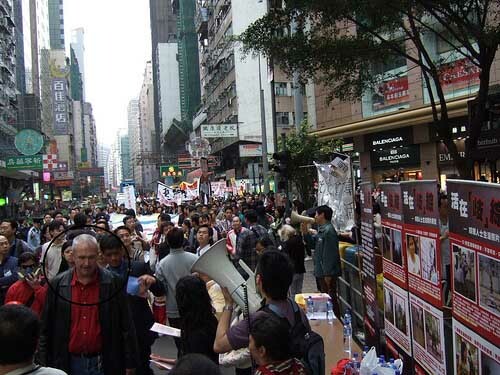 Within the group, about 200 had suddenly changed direction in Wanchai. They did not go to Government Headquarters, but went instead to Central to fight for the preservation of Queen's Pier. The police attempted to stop them at one point. After several discussions, they were allowed to proceed to Queen's Pier. But the police took films of the process. The above is just about the only mention in the mainstream media about these 200 people. Why isn't more reported about them? It is very simple. The gatekeepers of mainstream media have decided that there is no news value to their readers/viewers. There is no right or wrong about that kind of decision because it is a judgment call, but the fact is that such alternate voices are excluded from the mainstream media. And then there is the Internet. If you are interested in this case, you can find a lot about it. During colonial period, Hong Kong has been referred to as a borrowed space and borrowed time. After the handover in 1997, "Hong Kong people ruling Hong Kong" remains a political slogan. Hundreds of thousands of people took to the streets in 2003, 2004 to express their aspirations of direct election. Still, democracy is a distant dream. Worse still, urban and social planning on land use and distribution of wealth are biased towards corporate interests. Hong Kong people are yet to have a say to the use of their own space. Privatization of public space by consortiums: shopping centers in public housing estates originally managed by the Housing Authority have been privatized by The Link; the development West Kowloon are tilted towards corporate interests; The harbour front of Hong Kong Island, cut off from the living space of ordinary people, has turned into the backyard of luxurious private residential complexes or giant shopping mall; the Central seafront reclamation area also falls into the same fate -it is designed as an extension of government offices and the giant Mody Mall. The civil society has been launching different kinds of campaigns to protect their home, the struggles in the preservation of Star Ferry Pier and Queen Pier are symbolical, they are located at Central, a space occupied by government offices and corporate consortiums; we wish to reclaim the space, by people’s presence and solidarity, and declare people’s rights to plan our home. Universal suffrage is one way democracy manifests itself; we advocate direct participation in planning for our living space. We believe that this is the practice of democracy Here and Now. I have joined the local action team in the 318 rally and our slogan is "Our Home We Plan" - a call for participatory democracy in city and policy planning, by addressing some "deep conflicts" within our society inherited from the colonial system. The rally route is much longer, passing through old districts to be demolished joint handly by developers and government's Urban Renewal Bureau. 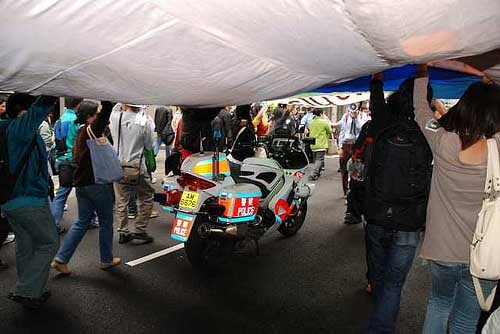 The SAR government followed through our rally team (around 200 people) with the same number (if not more) of police and undercovers, and greeted us with a sharp warning banner before we entered the old district at Wanchai, telling that we had violated the public security ordinance. Some of the participants were followed and interrogated by undercovers who belong to the central district crime squads, not to mention that the Hong Kong Island Vice Commander in Chief, Bicknell, had followed through our long rally route. Obviously someone has given them an order for sacrificing their weekend. At 11am, I went back to the office and began packing. I saw the banner stitched from a hundred pieces of cloth prepared by kiths the night before, and I was elated as well as worried. This was a heavy banner. Do we have the strength to raise it up? During the rally, we will also have to 8,000 booklets. I was very unsure. Many friends streamed over to say that they were marching with our small group. We all put on Star Ferry stickers and wore the green-white ribbons. Although we did not know each other well, these small decorations joined us together. More news came to say that the police will take action. A demonstration veteran said that he recognized many undercover police officers within our group. The people responsible for setting up the sound equipment at Queen's Pier said that the police has several police vans at Star Ferry. Our small march had been announced at the press conference by the Civil Human Rights Front and the police-citizen liaison unit had also been verbally notified on the day before the march. To demonstrate is a citizen's right. In 2003, we stopped the Article 23 legislation. But the public security ordinance used against second-class citizens during the colonial era was still enough to pose a threat to the basic rights of citizens. According to the public security ordinance, three or more people who group together in a public place may be charged with illegal assembly! Since 2003, our society has developed a huge resentment against these evil laws, and so the police and prosecutors have refrained from using the public security ordinance to go after demonstrators. Instead, they invoke criminal laws (such as charging Ho Loy with criminal vandalism as well as disorderly conduct in public space). Recently, the Donald Tsang administration wants to use his "popular support" to use the public security ordinance to stop demonstrations, beginning with the League of Social Democrats' demonstration against "small circle" election last week. On March 18, they intend to deal with us. This is just a case of resurrecting Article 23 through the evil public security ordinance of the colonial era! For this demonstration, we had reached agreement with the Civil Human Rights Front to let our group assume a position that was further up front. After we complete our march through the old district of Wanchai, we will time to rejoin the main body at the back. But before the march began, the Civil Human Rights Front people told us that "both the Civil Human Rights Front as well as the police would like the group to be at the rear of the march." When I heard that, I was thoroughly disappointed with the Civil Human Rights Front. On one hand, it was very clear to them that the police intended to take action against us. On the other hand, they cooperated with the police to ask us to be at the rear of the march. One can imagine that the police could use the tactic that they employed against the League of Social Democrats by preventing us from exiting Victoria Park! Therefore, we did not follow the request from the Civil Human Rights Front and we went into the middle of the march. There were between 100 and 200 people in the Local Action section. The demonstrators coming from the old districts of Tai Kok Tsui and Shum Shui Po used "big crocodiles" as sarcasm against the Urban Planning Department. For some of the grandpas and grandmas, this was their first ever demonstration march. When the group reached Fleming Road and was about to turn into the Wanchai old district, the police stopped us as soon as we went around the corner. We sat down in the middle of the road. The police raised an orange sign and said that our demonstration march has violated the public security ordinance. The demonstrators clapped and chanted. The police then asked us to put away the cloth banner on the grounds that it posed danger to citizens! How absurd! A cloth banner posed danger, but a hundred plainclothes and uniformed police officers armed with guns would not? The banner was put together by us stitch by stitch. We will not put it away! Finally, the police yielded and we entered the Wanchai market, the Blue House and Lei Tung Street to meet with the residents of the old Wanchai district. During the way, a dozen police video cameras recorded every move that the demonstrators made. When we went through the Wanchai market, the stall owners were surprised and delighted to see us because they did not expect anyone would be marching though the district. When we arrived at the Blue House, the residents expressed their desire to have the choice to stay or go. The seventy-something year old Fourth Sister gave her classical speech: "I am Fourth Sister and I live on the Fourth floor. I want to stay here." Most of the stores on Lei Tung Street are shuttered as a result of the actions of the construction "crocodiles." Sister May once against emphasized that it is only natural for people to be able to trade one shop for another shop in the same location instead of being forced to move away. The Lei Tung neighbors are trying to appeal the case to the Urban Planning Council. By the time that the group reached Queen's Pier, it was already 630pm. The plainclothes police officers surrounded the attendees. When a Wanchai resident spoke up, a police officer went up to within 6 inches of her to film her. The other uniformed policemen went up to surround the podium. Some demonstrators moved up to stop the police from interrupting the assembly. Afterwards, I found out that the uniformed policemen came from the Central police station and they had been getting ready for action since early afternoon. After a while, someone called some television stations to come and start filming, and the uniformed policemen withdrew. Actually, many of the friends have already left and it was not certain how many people were left in our assembly. Even if we counted all the undercover policemen, the total was about 50 people. It is doubtful that this could be characterized as an illegal assembly. Besides, to speak in public space, to read poetry, to sing and to perform are citizen rights. Could even these liberties be taken away from Hong Kong people too? We can't even complain about outside critics debasing Hong Kong, because the high officials have done a good job in ruining Hong Kong. After the assembly was over, there was another episode (see the account of a female student as reported at Reading China by Hegel Chong). ... I wanted to go home to have dinner. I left the people and walked towards the bus stop. There were two men coming to me. "Miss, I'm police. I have reasonable doubt that you had just joined an illegal assembly. I want to write down your ID information for record," said one of the police officers. "Ha! Holding banner and dancing are subject to penalty? Why didn't you ask for my ID in the crowd? Now there are so few people. You come to ask for it? Why are you so stingy?" said I. "Why don't you write down all people's ID?" said W.
"We already have their records," said a police. I don't know if I am able to get access to my file in police station according to the Privacy Bill. Perhaps, I would find out the photos me and W in the pier taken by "Ah Sir" (police officer)! Now I realize that the so-called "evil law" is just stingy. Walking back to the crowd who were about to leave, two officers from Police Liaison Office came out to negotiate. Two plainclothes still insisted on checking my ID at the very beginning. Later on, more people came together and we left in chaos. The two liaison officers told us that those two plainclothesmen came from the "Central Crime Unit". My friend MD laughed, "He is not even taller than my chest! What qualifies him to ask for my ID?" To be honest, this is the first time for me to be threatened by police. My intuition is not to show my ID. I thought that if they really had to arrest us, what I could do is to refuse to cooperate. YW was attentive. She wrote down our names in order to inform each other of the situation. In less than one minute conversation, you know that you are already identified by the police. I already felt terrified and furious for a whole night. For cracking down minority movement, this kind of psychological pressure is already very successful. If you care to look further, there is plenty more on the Internet, including video clips, photograph albums, diaries, etc.